But behind every awesome group of people (which we are) and behind every stellar pint of beer (which we have) is a good story (3 for3!) The Ranville family initially settled on Mackinac Island several hundred years ago, along with French explorers, traders, voyagers, and a bunch of other cool, adventuresome lads and ladies. We then moved to the mainland, and operated a fishing business in the area where the state docks are now located along the Mackinaw City waterfront. Good times were had, outlandish shenanigans took place, and our happy family grew happier. There’s a lot more to tell, but they are stories better shared over a pint of good brew. We choose to spell Biere the French way as a nod to our ancestors, who settled in the most beautiful place on the planet, and facilitated the opportunities that got us to where we are, which is a pretty amazing place to be! Don’t be fooled by that fancy spelling, though; we won’t correct you on the pronunciation because we aren’t even sure if we say it right. Good beer and good food. That’s all we care about. Stop in some time, grab a pint (or, you know, realistically more than one) and enjoy! Cheers! Originally built in 1890, re-opened in 2000, 2 story log restaurant, features – great food, large portions, reasonable prices & nightly dancing, Mackinaw’s Hot Spot. Located at the corner of Huron and Central, across from Shepler’s Ferry. Mackinaw’s largest Black Angus steaks, burgers, & tangy ribs. Casual dining. Lunch and Dinner. Full bar. Sandwiches – Dinner Salads – Fresh seafood. Children’s menu. Group bookings. The Keyhole Bar in Mackinaw City has been around for over 45 years so our collection of keys and locks has grown quite large and are displayed throughout the bar in various and unique ways. Over 25,000 keys cover the walls, bars, and tables. We offer one of the biggest menus in Mackinaw City to help satisfy the varieties of appetites that visit our quaint little town. We serve Burgers, Perch, BBQ Ribs, Whitefish, Walleye, Shrimp, Mexican Food, Wraps, Chicken, Steaks as well as a variety of other Sandwiches, Appetizers, Daily Specials and Homemade Soups. The Keyhole was named the Best Seafood Dive in Michigan by Coastal Living Magazine for 2011. We were also voted “Best Bar In Northern Michigan and Upper Peninsula Regions” by the readers on mLive.com for 2014. We also offer a Kids Menu for the little ones to enjoy with free kid drinks. On tap we have a variety of beers depending on the season. Some of those beers include Bud Light, Miller Lite, Labatt, Pabst, Bell’s Oberon, Fat Tire, Perrin Grapefruit IPA, Perrin IPA, Petoskey Horny Monk, Leinenkugel Summer Shandy, Sam Adams Octoberfest and Cheboygan Brewing Co.Lighthouse Amber Ale. Stop on in and see the uniqueness of keys like you have never seen before. 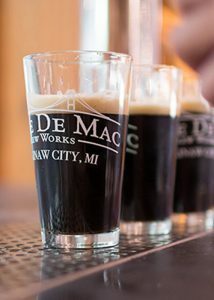 Click the “Like” button on our page so you can keep up on what is going on in Mackinaw City and the Keyhole Bar & Grill! See You Soon!!! Largest Copper Bar in Northern Michigan! 16′ Sports Screen!